The evening light falls through bare branches to the forest floor, illuminating the few remaining leaves that are not on the ground. Soon darkness will fall. Soon the leaves will fall. So ends the day. There was a feeling of transition in the air at Hinckley Lake today. It didn’t feel like summer, though it is still summer. It didn’t feel like autumn, which it isn’t. It is some in-between, transitional season. 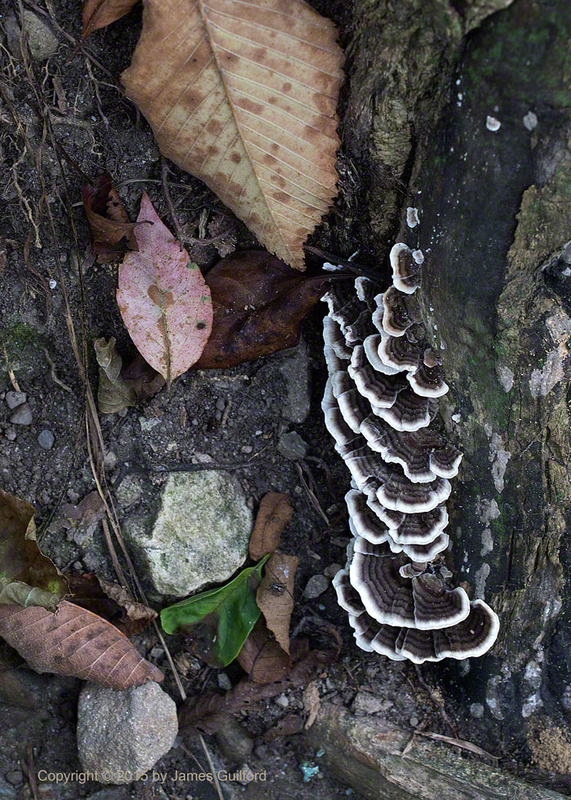 On the ground, at the base of a tree, was an illustration of change: a green leaf, leaves fading from color to lifeless, beautiful fringed fungi thriving on a dead tree branch, and ultimately soil. Wednesday morning dawned beautifully with clear skies and dew-covered plants. 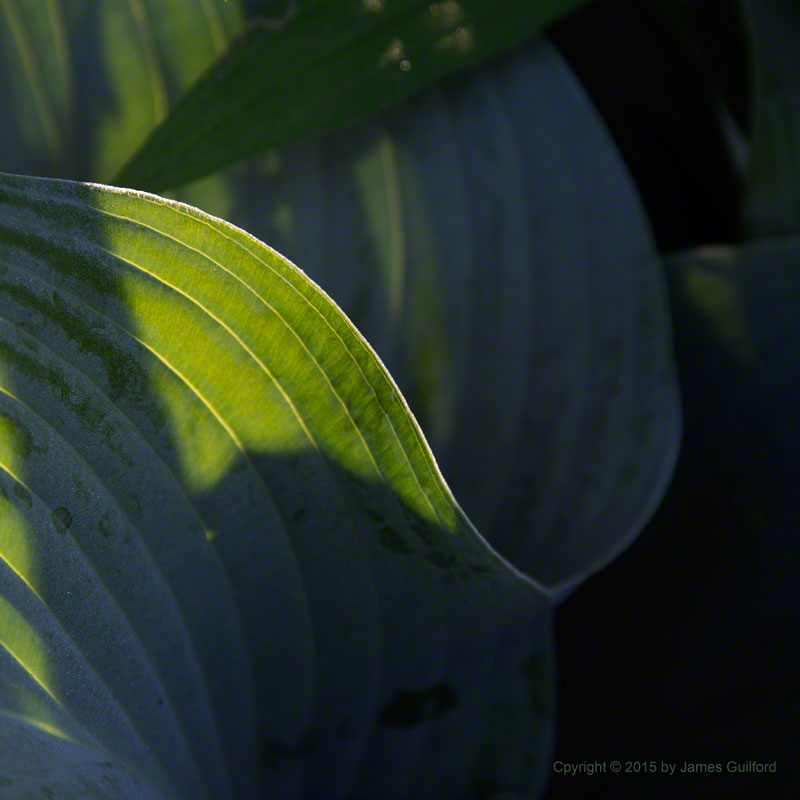 It was a fine time for a little walk and I was rewarded with sun and shadow scenes such as this. Thursday morning was beautiful. The day began cool, bright, and fresh. Wild plants reflected those conditions. 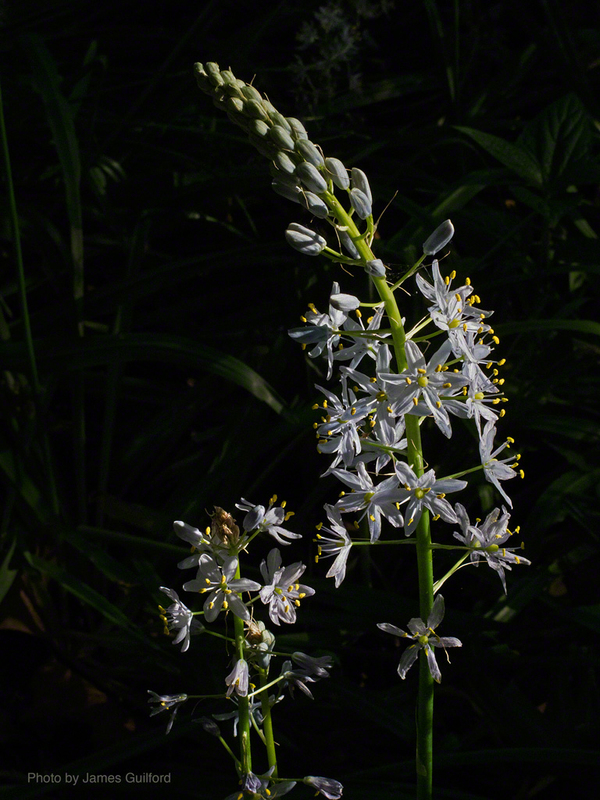 Looking around as I drove, I spied an area in the woods where spikes of wild hyacinth (Camassia scilloides) were spotlit by sun. 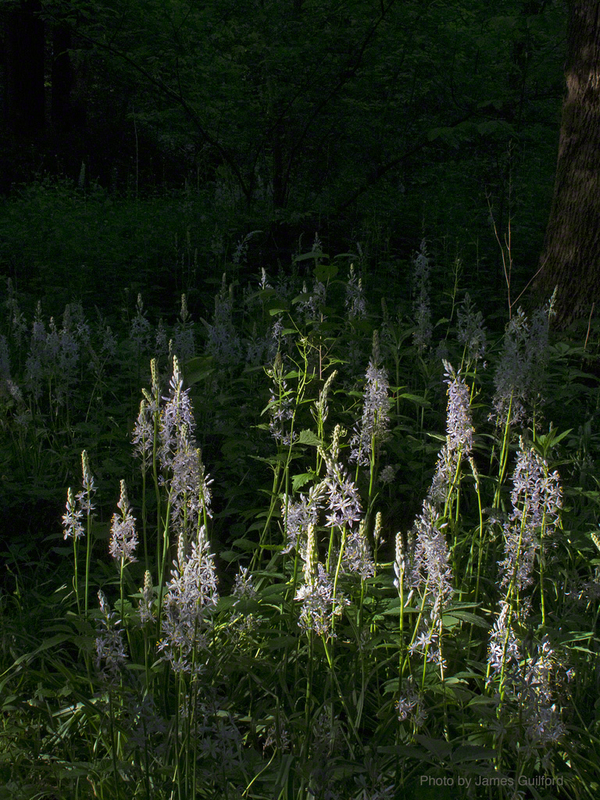 Spots of sun, breaking through the burgeoning leaves of the woodland canopy, illuminated the lavender-tinted petals and they “popped” against the dark ground below. 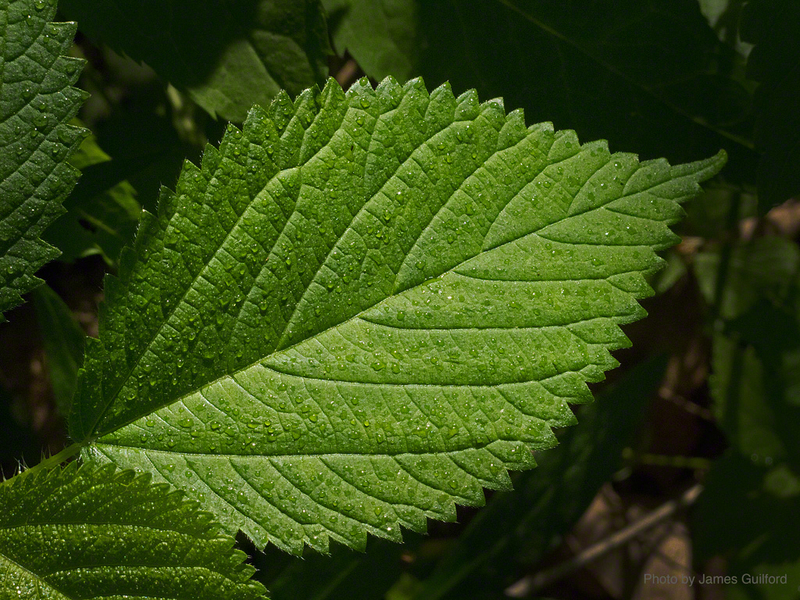 Of course I pulled my car over and spent a few minutes photographing leaves and flowers. If I wasn’t due some place I would have easily spent an hour exploring and photographing. Duty, however, had a strong pull. I spent only a few minutes but those few minutes were a great start that green day morning. Pardon me if I’m confused. It was another beautiful spring morning and I had a tiny bit of spare time… enough to stop by the park in Olmsted Falls. I spent a relaxing few minutes enjoying the fresh air, listening to water flowing over rocks in the nearby river, and observing the morning light's effects on the scenery around me. 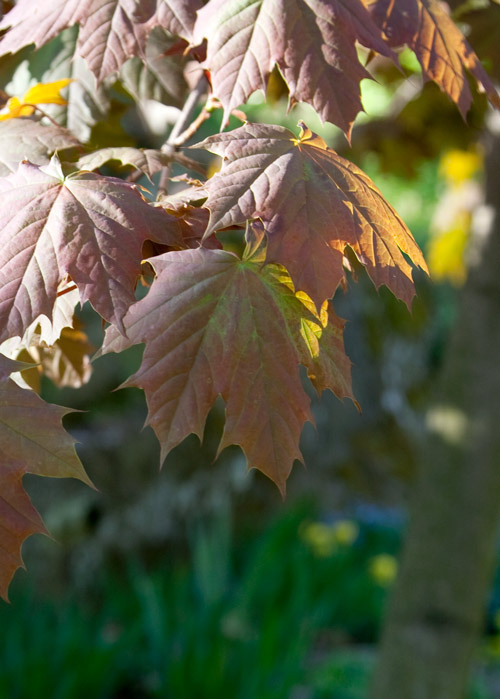 I was about to leave, not even having unpacked my camera, when I spotted some young tree leaves. They were lit up in a golden tone I haven't seen since last fall… in April. I can't explain the biology and physics at work here, not that it matters much to the resulting beauty of early morning light pouring through young tree leaves with a dark wall of rock as background. One day the weather is hot, the next morning there's frost on the windows. These leaves look like fall but the day felt like spring. Pardon me if I'm confused. The weekend of October 24 & 25 brought the peak of fall color to Northeastern Ohio. 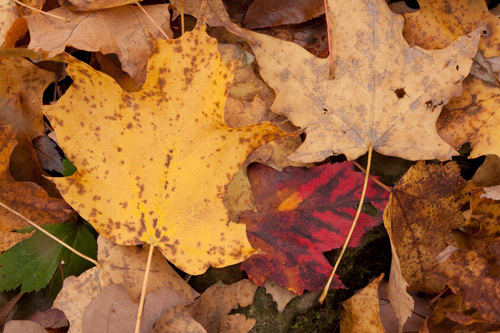 Saturday was mostly gray and windy sending many colorful leaves whirling and to the ground. Some trees now appear naked of the leafy covers they have carried since spring. It was a good day for errands and household checklists. 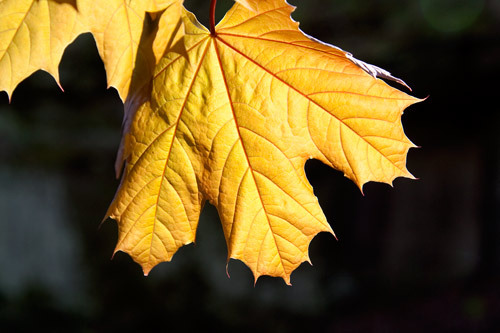 Overnight the skies cleared and today dawned chilly and clear — a fine day for a fall color drive. Piling into the Insight we headed south. Slightly past peak were the colors in North Central Ohio at Malabar Farm State Park. The entire area was gorgeous, nonetheless, decorating even the forest floor with a confetti-throw of leaves. We decided to follow a one-mile trail that headed uphill, through dense neighboring woods, for a loop back to the Farm. The trail had many wonderful sights to see and was fairly well marked until somewhat short of the half-way point. Seeing no trail blazes we continued on what appeared to be trampled leaves, began our turn back, and paralleled a road though still walking in damp leaf litter within the woods. In no danger of becoming lost we easily found our way back to the Farm's homestead. Then it was off on a cross-country trip over state roads (not freeways) towards home. The scenery was absolutely beautiful with groves of trees on low hills rising like islands out of a sea of brown soybean and corn fields. It was a fine rolling journey back under sunny skies. It was a most excellent Sunday's sojourn experiencing the best fall colors.